Lindberg faced a rash of adversity in this, his NCAA debut year, stuff that would buckle the knees of a strong kid. Lindberg’s competition in goal, Matt Murray, was having a banner year, relegating Fille to the distant reaches of the UMass bench. Lindberg took a three-week sabbatical at the World Juniors, and his reward for an IIHF gold medal was an illness that sidelined him even longer. It wasn’t rock bottom, but it was close. For kid who just turned 20, Lindberg showed impressive maturity in figuring out a way to cope with his crisis. The display of character did not go unnoticed. That’s a major understatement. Including that relief appearance, the freshman has given up just three goals in his five postseason games. 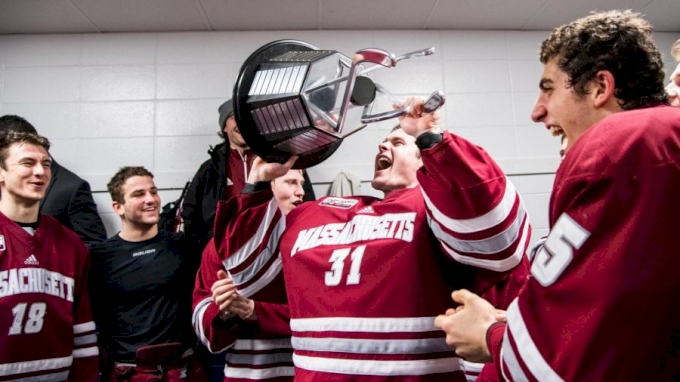 Even in the UMass loss to Boston College in the Hockey East semis, the kid remained unflappable. Lindberg kept his job, and rewarded the faith of his coaches with an impeccable two games in the NCAA Northeast Regional: 30 shots, 30 saves. And now this blonde Nord is on the biggest stage in college hockey, with the full support of his team as they look to slay two dragons. Don’t bother reminding Lindberg that he is a mere freshman. “I don’t really care I’m a freshman,” Lindberg said. “It doesn’t matter. It’s the same game. I’m just going to do what I do.